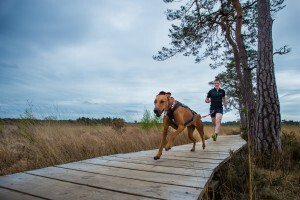 The most important piece of equipment to get right is your dog’s canicross harness. The non stop free motion canicross harness is a fantastic harness if you are looking for a high performance and more technical piece of equipment. It’s ideal if you run with a strong pulling dog; large or small. 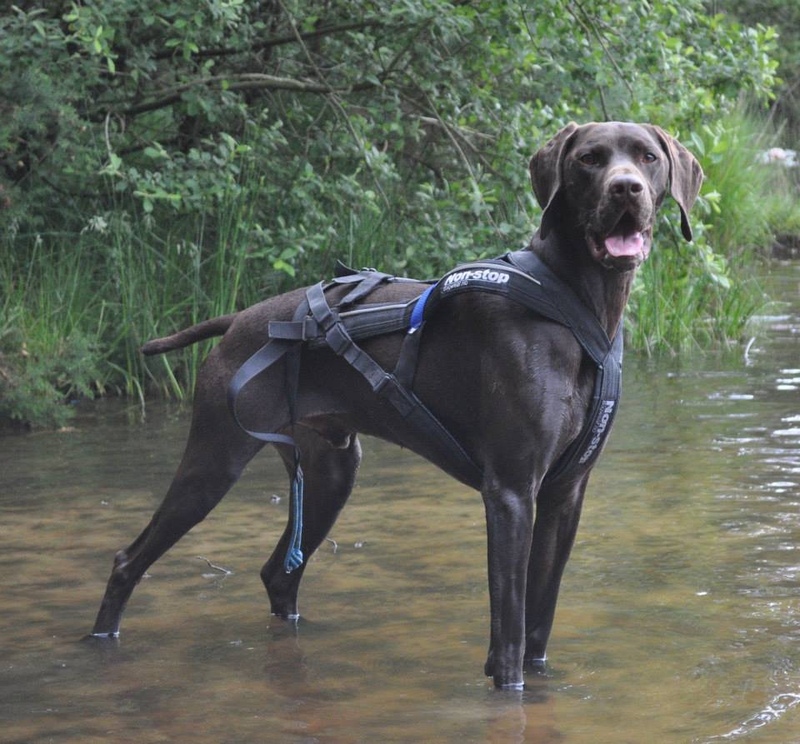 It has been designed to ensure your dog always has unobstructed airways whilst pulling, and has a pulling point which does not impede on the dog’s movement & force. In order to reduce any risk of back strain, the harness may be adjusted to accommodate each individual dog. Before we explain how to fit the harness it’s important that you get the correct size harness in the first place. So you will need to take some essential measurements. 1. For the neck, measure fully around the lower part of your dog’s neck close to the top of the chest (this is lower than where the collar would sit). 2. For the front strap measurement, measure from the sternum (the bone in the front of the chest) to just behind your dog’s front legs. Please note, if your dog is a muscular breed or particularly deep chested you may need to go up a size. Do double check your measurements to be on the safe side, as it’s critical you get the right size, and then refer to our sizing guide to select the appropriate canicross harness, which also factors in your dog’s weight. To fit the harness you put your dog’s head through the main loop ensuring the section with the colour strips is on the dog’s back. Then bring the harness as far forward up your dog’s neck as it can go, pull it down and gently bring each leg up and through the corresponding loop. When you straighten out the harness it should be nice and snug around the neck (you should be able to fit two fingers between the neck and the harness when it’s loose or pulled tight), it should be sitting comfortably on the breastbone and back of the neck and it should be clear of the front legs. The end of the harness (excluding the loop at the very end) should come to the base of the tail. You may need to make some small adjustments to the straps on the harness to get it fitting just right. You then attach your line to the hook at the end and you are ready to go! The Non Stop Freemotion Harness is perfect for strong pulling dogs like Red! To remove the harness, simply bring it as far forward as it can go, pull the harness down and then gently bring each leg back through the loop. One you’ve done that, all that’s left is to bring the head back through. And that’s how you fit a Non Stop Freemotion canicross harness. 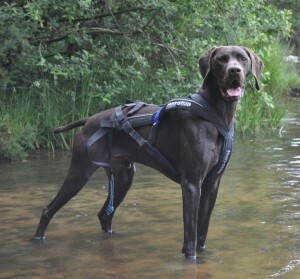 Visit the Dogfit Shop to see our selection of harnesses. Written by Gail Walker. Gail is co-founder of Dogfit. 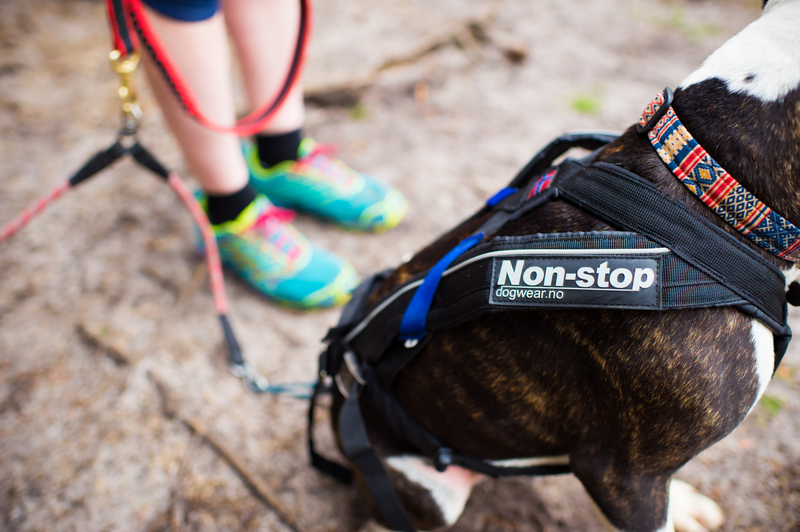 My Story : How canicross has transformed Karen and Skip’s lives.